Unlike eyes, which are generally instantly recognizable, ears differ greatly in their appearance throughout the animal kingdom. Some hearing structures may not be visible at all. For example, camouflaged in the barn owl’s facial ruff—a rim of short, brown feathers surrounding the bird’s white face—are clusters of stiff feathers that act as external ears on either side of its head. These feather structures funnel sound collected by two concave facial disks to the ear canal openings, increasing the bird’s hearing sensitivity by 20 decibels—approximately the difference between normal conversation and shouting. Similar increases in sensitivity result from the large and often mobile external structures, or pinnae, of many mammals, such as cats and bats. Internally, the differences among hearing organs are even more dramatic. For a period of at least 50 million years after amniotes arose, the three main lineages were most likely quite hard of hearing. Together, these hair cells and nerve fibers encode a wide range of sounds that enter the ear on that side of the head. Two ears complete the picture, allowing animals’ brains to localize the source of the sounds they hear by comparing the two inputs. Although it seems obvious that the ability to process nearby sounds would be enormously useful, modern amniote ears in fact arose quite late in evolutionary history, and to a large extent independently in different lineages. As a result, external, middle, and inner ears of various amniotes are characteristically different.1 New paleontological studies and comparative research on hearing organs have revealed the remarkable history of this unexpected diversity of ears. Amniote vertebrates comprise three lineages of extant groups that diverged roughly 300 million years ago: the lepidosaurs, which include lizards and snakes; the archosaurs, which include crocodilians and birds; and mammals, which include egg-laying, pouched, and placental mammals. By comparing the skulls of the extinct common ancestors of these three lineages, as well as the ears of the most basal modern amniotes, researchers have concluded that ancestral amniotes had a small (perhaps less than 1 millimeter in length) but dedicated hearing organ: a sensory epithelium called a basilar papilla, with perhaps a few hundred sensory hair cells supported by a thin basilar membrane that is freely suspended in fluid. These rudimentary structures evolved from the hair cells of vestibular organs, which help organisms maintain their balance by responding to physical input, such as head rotation or gravity. Initially, the hearing organ only responded to low-frequency sounds. On their apical surface, all hair cells have tight tufts or bundles of large, hairlike villi known as stereovilli (or, more commonly stereocilia, even though they are not true cilia), which give hair cells their name. Between these stereovilli are proteinaceous links, most of which are closely coupled to sensory transduction channels that respond to a tilting of the stereovilli bundles caused by sound waves. The amniote hearing organ evolved as a separate group of hair cells that lay between two existing vestibular epithelia. Low-frequency vestibular hair cells became specialized to transduce higher frequencies, requiring much faster response rates. This change is attributable in part to modifications in the ion channels of the cell membrane, such that each cell is “electrically tuned” to a particular frequency, a phenomenon still observed in some modern amniote ears. Moreover, the early evolution of these dedicated auditory organs in land vertebrates led to the loss of the heavy otolithic membrane that overlies the hair-cell bundles of vestibular organs and is responsible for their slow responses. What remains is the watery macromolecular gel known as the tectorial membrane, which assures that local groups of hair cells move synchronously, resulting in greater sensitivity. Good high-frequency hearing did not exist from the start, however. For a period of at least 50 million years after amniotes arose, the three main lineages were most likely quite hard of hearing. They had not yet evolved any mechanism for absorbing sound energy from air; they lacked the middle ear and eardrum that are vital for the function of modern hearing organs. As such, ancestral amniotes most likely perceived only sounds of relatively low frequency and high amplitude that reached the inner ear via the limbs or, if the skull were rested on the ground, through the tissues of the head. It is unclear what kind of stimuli could have existed that would have led to the retention of such hearing organs for such a long time. CONVERGING ON THE EAR: Starting around 250 million years ago, the three amniote lineages—lepidosaurs (lizards and snakes), archosaurs (crocodilians and birds), and mammals—separately evolved a tympanic middle ear, followed by evolution of the inner ear, both of which served to increase hearing sensitivity. Despite the independent origin of hearing structures in the three lineages, the outcomes were functionally quite similar, serving as a remarkable example of convergent evolution. The tympanic middle ear is the assemblage of tiny bones that connects at one end to an eardrum and at the other end to the oval window, an aperture in the bone of the inner ear. Despite the temporal coincidence in the evolution of these structures in the three amniote lineages and the functional similarities of the adaptations, the groups were by this time so far separated that the middle ears evolved from different structures into two different configurations. The single middle-ear bone, the columella, of archosaurs and lepidosaurs derived from the hyomandibular, a bone that earlier had formed a large strut connecting the braincase to the outer skull. In modern representatives, the columella is long and thin, with several, usually cartilaginous extensions known as the extracolumella. One of these, the “inferior process,” connects the inner surface of the eardrum and the columella, which then connects to the footplate that covers the oval window of the inner ear. This two-part system forms a lever that, together with the pressure increase incurred by transmitting from the much larger eardrum to the footplate, greatly magnifies sound entering the inner ear. In the mammals of the Triassic, the equivalent events were more complex, but the functional result was remarkably similar. Mammal ancestors reduced the number of bones in the lower jaw from seven to one and, in the process, formed a new jaw joint. Initially, the old and new jaw structures existed in parallel, but over time the old joint moved towards the rear of the head. This event, which at any other time would likely have led to the complete loss of the old joint bones, occurred simultaneously with the origin of the mammalian tympanic middle ear. Older paleontological and newer developmental evidence from Shigeru Kuratani’s lab at RIKEN in Japan indicate that the mammalian eardrum evolved at a lower position on the skull relative to that of the other amniotes, a position outside the old jaw joint.3 In time, the bones of this old joint, together with the hyomandibula, became the three bony ossicles (malleus, incus, and stapes) of the new middle ear. Like the middle ear of archosaurs and lepidosaurs, these ossicles form a lever system that, along with the large area difference between eardrum and footplate, greatly magnifies sound input. Thus, remarkably, these complex events led independently to all modern amniotes possessing a middle ear that, at frequencies below 10 kHz, works equally effectively despite the diverse structures and origins. There is also evidence that the three-ossicle mammalian middle ear itself evolved at least twice—in egg-laying mammals such as the platypus, and in therians, which include marsupials and placentals—with similar outcomes. PITCH PERFECT: The hearing organs of amniotes are organized tonotopically, with hair cells sensitive to high frequencies at the basal end of the papilla, grading into low-frequency hair cells at the apical end.BASED ON MED-EL WWW.MEDEL.COMThe evolution of tympanic middle ears kick-started the evolution of modern inner ears, where sound waves are converted into the electrical signals that are sent to the brain. The inner ear is least developed in the lepidosaurs, most of which retained a relatively small auditory papilla, in some just a few hundred micrometers long. Many lepidosaurs, predominantly diurnal species, also lost their eardrum. Snakes reduced their middle ear, limiting their hearing to frequencies less than 1 kHz, about two octaves above middle C. (For comparison, humans can hear sounds up to about 15 or 16 kHz.) Clearly, hearing was not under strong selective pressure in this group. There are a few exceptions, however. In geckos, for example, which are largely nocturnal, the papillar structure shows unique specializations, accompanied by high sensitivity and strong frequency selectivity. Indeed, the frequency selectivity of gecko auditory nerve fibers exceeds that of many mammals. One part of the inner ear that did improve in lizards (but not in snakes) is the hair cells, with the papillae developing different areas occupied by two structural types of these sound-responsive cells. One of these hair cell groups responds to sounds below 1 kHz and perhaps corresponds to the ancestral version. The higher-frequency hair cells have a more specialized structure, particularly with regard to the size and height of the stereovilli, with bundle heights and stereovillus numbers varying consistently along the papilla’s length. Taller bundles with fewer stereovilli, which are much less stiff and therefore respond best to low frequencies, are found at one end of the membrane, while shorter, thicker bundles with more stereovilli that respond best to higher frequencies are found at the other end—a frequency distribution known as a tonotopic organization. Still, with the exception of one group of geckos, lizard hearing is limited to below 5 to 8 kHz. In contrast to the relatively rudimentary lepidosaur inner ear, the auditory papilla of archosaurs (birds, crocodiles, and their relatives) evolved much greater length. Owls, highly proficient nocturnal hunters, boast the longest archosaur papilla, measuring more than 10 millimeters and containing many thousands of hair cells. As in lizards, archosaur hair cells show strong tonotopic organization, with a gradual change in the diameter and height of the stereovillar bundles contributing to the gradually changing frequency sensitivity along the papilla. 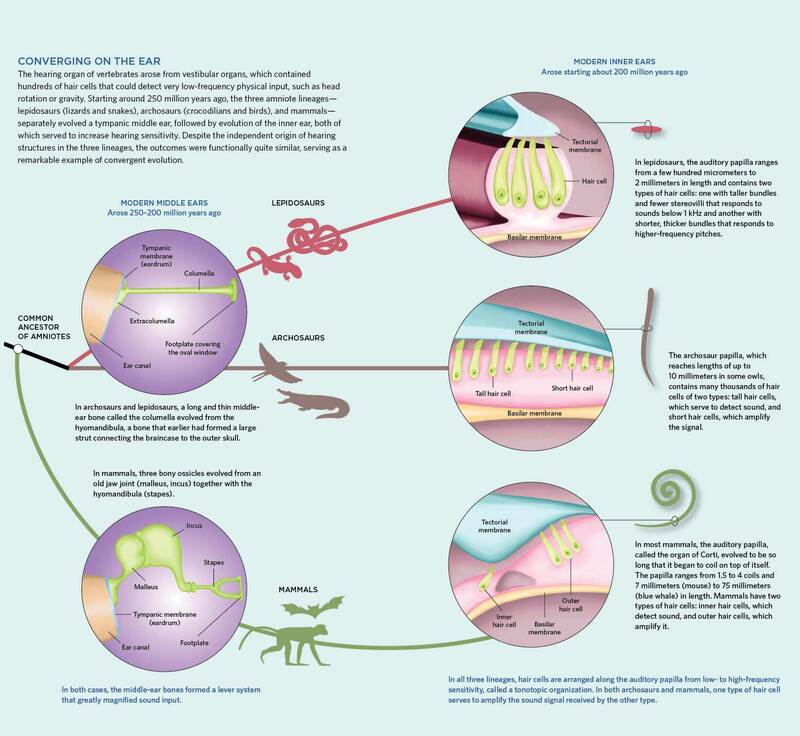 In addition, the hair cells are divided along and across the basilar membrane, with tall hair cells (THCs) resting on the inner side and the apical end, most distant from the middle ear, grading into short hair cells (SHCs) on the outer side and at the basal end. Interestingly, many SHCs completely lack afferent innervation, which is the only known case of sensory cells lacking a connection to the brain. Instead of transmitting sensory information to the brain, these hair cells likely amplify the signal received by the inner ear. Despite the more complex anatomy, however, bird hearing is also generally limited to between 5 and 8 kHz, with the exception of some owls, which can hear up to 12 kHz. The mammalian papilla, called the organ of Corti, also evolved to be larger—generally, but not always, longer than those of birds—but the extension in length varies in different lineages.4 Mammalian papillae also have a unique cellular arrangement. The papillae of modern egg-laying monotremes, which likely resemble those of the earliest mammals, include two groups of hair cells separated by numerous supporting pillar cells that form the tunnel of Corti. In any given cross section, there are approximately five inner hair cells (IHCs) on the inner side of the pillar cells, closer to the auditory nerve, and eight outer hair cells (OHCs) on the outer side. In therian mammals (marsupials and placentals), the numbers of each cell group have been much reduced, with only two pillar cells forming the tunnel in any given cross-section, and generally just a single IHC and three or four OHCs, though the functional consequences of this reduction remain unclear. About 90 percent of afferent fibers innervate IHCs, while only 10 percent or fewer innervate OHCs, despite the fact that OHCs account for some 80 percent of all hair cells. As with bird SHCs that lack afferent innervation, there are indications that the main function of OHCs is to amplify the physical sound signal at very low sound-pressure levels. Therian mammals also evolved another key hearing adaptation: the cochlea. Shortly before marsupial and placental lineages diverged, the elongating hearing organ, which had always been curved, reached full circle. The only way to further increase its length was to form more than one full coil, a state that was reached roughly 120 million years ago. The result is hearing organs with 1.5 to 4 coils and lengths from 7 millimeters (mouse) to 75 millimeters (blue whale). Hearing ranges also diverged, partly depending on the size of the animal (larger mammals tend to have lower upper-frequency limits), but with a number of remarkable specializations, as expected in a lineage that radiated greatly during several evolutionary episodes. As a result of these adaptations, most mammals have an upper frequency-response limit that well exceeds those of lepidosaurs and archosaurs. Human hearing extends to frequencies of about 15 kHz; a guinea pig can hear sounds up to about 45 kHz; and in the extreme cases of many bats and toothed whales, hearing extends into ultrasonic frequencies, sometimes as high as 180 kHz, allowing these animals to echolocate in air and water. This impressive increase in frequency limits is due to an extremely stiff middle ear, as well as a stiff cochlea. During early therian evolution, the bone of the canal surrounding the soft tissues invaded the supporting ridges of the basilar membrane, creating stiff laminae. Such bony ridges were retained in species perceiving ultrasonic frequencies, but tended to be reduced and replaced by softer connective-tissue supports in those with lower-frequency limits, such as humans. Three hundred million years of evolution have resulted in a fascinating variety of ear configurations that, despite their struc­tural diversity, show remarkably similar physiological responses. Geoffrey A. Manley is a retired professor from the Institute of Zoology at the Technical University in Munich, Germany. He is currently a guest scientist in the laboratory of his wife, Christine Köppl, at Oldenburg University in Germany. G.A. Manley, C. Köppl, “Phylogenetic development of the cochlea and its innervation,” Curr Opin Neurobiol, 8:468-74, 1998. J.A. Clack, “Patterns and processes in the early evolution of the tetrapod ear,” J Neurobiol, 53:251-64, 2002. T. Kitazawa et al., “Developmental genetic bases behind the independent origin of the tympanic membrane in mammals and diapsids,” Nat Commun, 6:6853, 2015. G.A. Manley, “Evolutionary paths to mammalian cochleae,” JARO, 13:733-43, 2012. A.J. Hudspeth, “How the ear’s works work: Mechanoelectrical transduction and amplification by hair cells,” C R Biol, 328:155-62, 2005. A.C. Crawford, R. Fettiplace, “The mechanical properties of ciliary bundles of turtle cochlear hair cells,” J Physiol, 364:359-79, 1985. G.A. Manley et al., “In vivo evidence for a cochlear amplifier in the hair-cell bundle of lizards,” PNAS, 98:2826-31, 2001. B. Kachar et al., “Electrokinetic shape changes of cochlear outer hair cells,” Nature, 322:365-68, 1986. Y. Liu et al., “Convergent sequence evolution between echolocating bats and dolphins,” Curr Biol, 20:R53-R54, 2010. C. Köppl et al., “Big and powerful: A model of the contribution of bundle motility to mechanical amplification in hair cells of the bird basilar papilla,” in Concepts and Challenges in the Biophysics of Hearing, ed. N.P. Cooper, D.T. Kemp (Singapore: World Scientific, 2009), 444-50. M. Beurg et al., “A prestin motor in chicken auditory hair cells: Active force generation in a nonmammalian species,” Neuron, 79:69-81, 2013. C. Bergevin et al., “Salient features of otoacoustic emissions are common across tetrapod groups and suggest shared properties of generation mechanisms,” PNAS, 112:3362-67, 2015. Correction (September 15, 2015): Citation #8 of this story has been updated to accurately reflect the research referenced in the text. The Scientist regrets the error.